SAUDI ARAMCO hopes to start cleaner fuels and aromatics production at its largest crude oil refinery in Ras Tanura by 2016, and help supply its new petrochemicals joint venture with Dow Chemical, a senior Aramco executive says. “The project will additionally add value to our downstream portfolio to produce cleaner fuels and also increase production of paraxylene, benzene and toluene,” Abdulaziz Al Judaimi, vice president of chemicals at Aramco says. “I would say between 2015 and 2016,” he says when asked about the expected start-up date of the project which will have an annual production capacity of around 1 million metric tonnes of aromatics. Aramco plans to boost its refining capacity to 8 million barrels per day (mbpd) within a decade to maximise revenues from oil and hopes integration between refineries and petrochemicals will boost profitability. It is building three new refineries in Saudi Arabia, one in the East with French Total, one near the Red Sea city of Yanbu with China’s Sinopec, and another at Jizan, near the border with Yemen. All will produce cleaner fuels and some petrochemicals. Aramco has already started upgrading existing refineries with a $2 billion project at a joint venture with US-based ExxonMobil due to be operation in 2013. Judaimi says Aramco would undertake similar clean fuels projects at Jizan refinery and the Rabigh Phase 2 project. 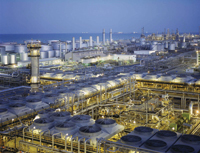 Rabigh 2 is an expansion of the already operational PetroRabigh, a joint venture between Aramco and Japan’s Sumitomo Chemical. Aramco aims to balance its long dependence on oil with large investments in chemicals and Judaimi says the company’s strategy would focus on mixed feed cracking. Saudi gas feedstock prices are set far below international prices at 75 cents per million British thermal units.